Claiming my tiny piece of the blogosphere but mainly using this space to talk to myself. Live in London. ♥ Lebanon, writing, conservation, technology and discussing women's issues. Madly in love with a city called Dubai. I was lucky to be hosted on one of Lebanon's top TV shows: MTV's "Talk of The Town" to discuss "Summer Blast". I was even asked who would make good actresses if my book was ever turned into a movie! BBC: "Talking Publishing In The Middle East"
Gulf News: "Don't Let The Warlords Win"
Time Out Beirut "Genre Busting New Novel"
Khaleej Times: "Beautifully and lightly portrayed"
Timeout Dubai: "TimeIn with Summer Blast"
The Cube: "Hard to Put Down"
Al Bawaba: "Chicklit And Cup Cakes In The City"
Born in the US, grew up in Beirut and lucky to have lived in Brussels, Kuwait, Dubai and now London. 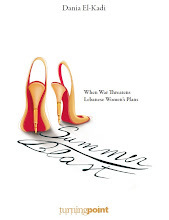 My novel "Summer Blast", a chicklit story based in Beirut, Dubai and New York was published in March 2011. My first short novel, "un chemin sur son front, le journal d'une rebelle" was published in 2000 by Éditions Caractères in Paris.